I love snow days. Seriously, when there is the first hint that we may get a major storm I start to stalk the weather blogs and watch the predictions of 4, 5, 6, or more inches and keep my fingers crossed that the world will come to a halt for just a day. We have snow day rituals in our home that require us to a) build a fire b) bake and c) roast something. More and more, my husband, Michael, is the chief cook on such days and today was no exception. He made potato leek soup and Irish soda bread for lunch and there is a slow cooking (200 degrees) roast beef noisily caramelizing in the oven right now. Unfortunately, I worked all day, but working in front of a roaring fire with your loved ones nearby is a pretty sweet work-life balance. 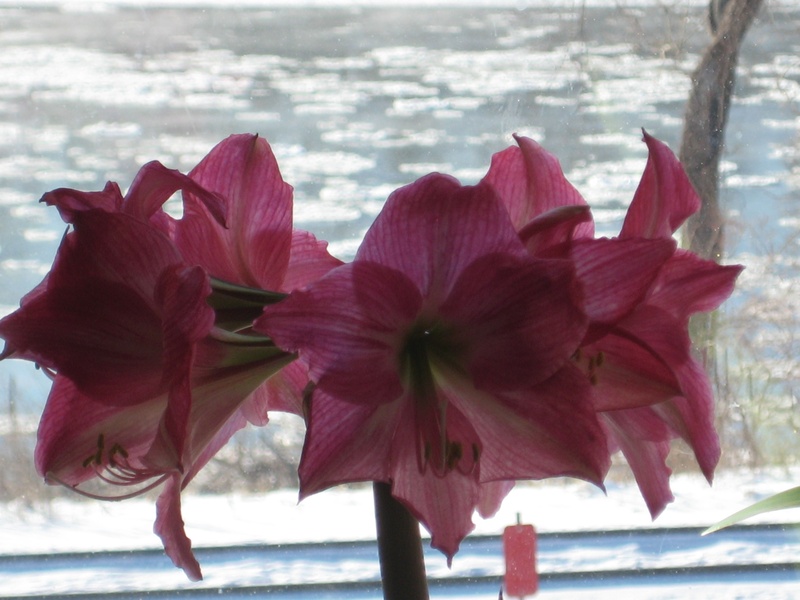 My mom sent me this picture of her amaryllis in bloom–the backdrop is the icy Missouri river. 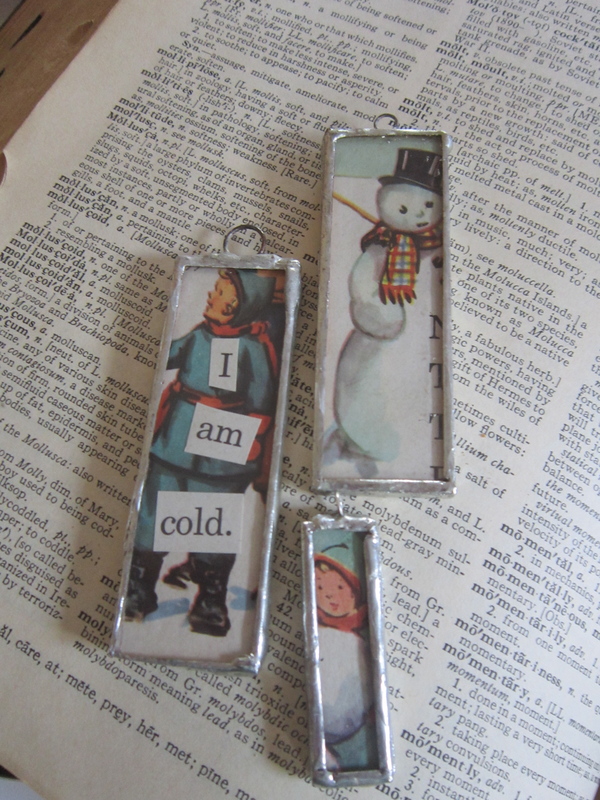 Some recent soldered charms i made using 1940s children’s books–expressing my feelings about snow! Poor guy. 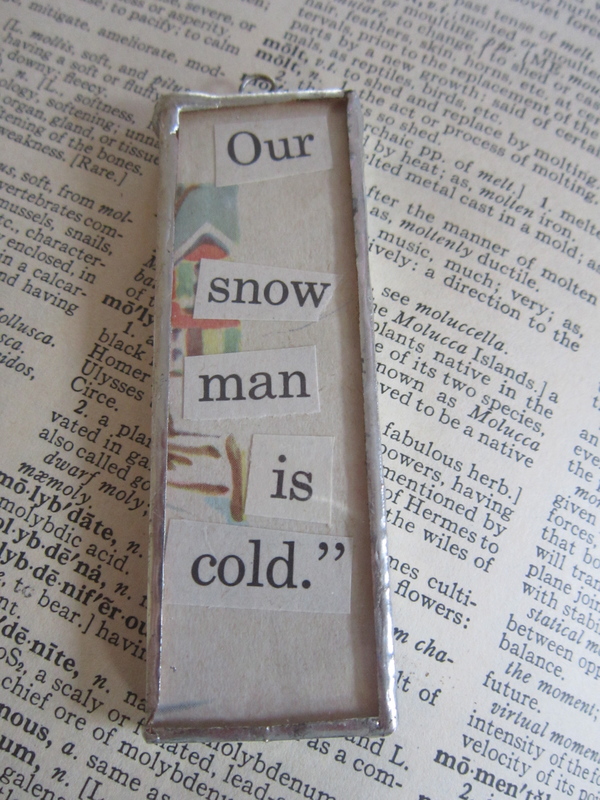 All snowmen should have coats, don’t you think? This may be why I like snow days. 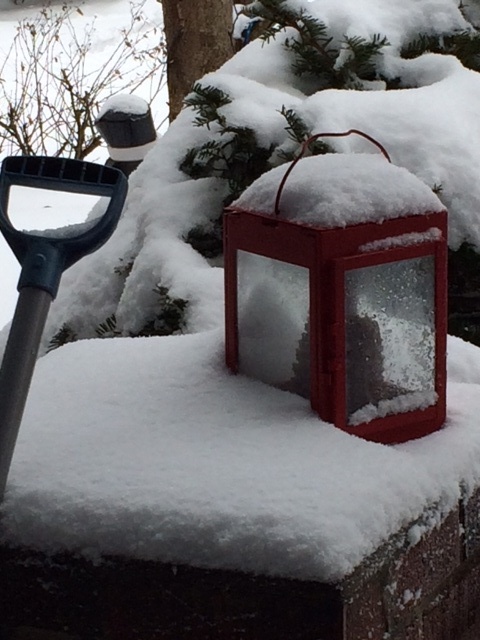 As long as we have electricity and heat and plenty of chocolate, the snow is a welcome pause in our hectic lives. With email and gotomypc and such, we are never really disconnected from work, so things that must be done are still done around here, but I just love looking up from my computer and seeing husband and child doing their thing while I do mine. I also love to go around the house singing, “Snow, snow, snow,” per White Christmas and Rosemary Clooney. I will pass on washing my hair in snow but just the thought of snow can make me smile–with or without Bing Crosby or Danny Kaye.